Researchers are uncovering the importance of ​the trillion-plus kinds of ​microbes ​on the planet — even as they worry the richness could be disappearing. May 23, 2017 — In southwestern Africa, a dozen scientists dig in the dirt. In a week, they’ve transected 100 miles of shifting sand dunes and flat gravel plains across the Namib Desert, one of the driest places on Earth. They’ve filled hundreds of small sandwich bags with soil along the way. The conditions are too harsh for most plant and animal life, but countless unidentified microbes thrive here. The researchers, led by Don Cowan, a microbiologist at the University of Pretoria in South Africa, are on a quest to survey the Namib’s microbial life. 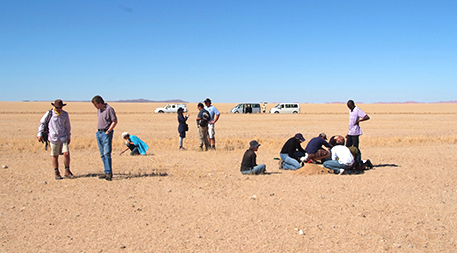 Their findings will shed new light on the biodiversity of African soils. By some estimates, fewer than 1 percent of all bacteria species have been identified, and bacteria are only one type of microbe. Some microbiologists say microbial “dark matter” forms the invisible backbone of life on our planet and plays a huge role in essential processes such as carbon and nutrient cycling. Bacteria help store carbon from the atmosphere in the soil or the ocean. Microbes also play a key role in global food webs. Yet even as we’re beginning to discover this microbial richness, some scientists worry it could be slipping away. Studies have shown that soils disturbed by environmental change boast less bacterial diversity than undisturbed soils. Just as Darwin, Audubon, Muir and other naturalists of old once described the planet’s plants and animals, these new naturalists are now scrambling to catalog Earth’s rich microbial infrastructure. Their work is transforming the way we think about agriculture, energy and ecosystems, and could ultimately help us reduce human impacts on the environment. “We’re doing something that no one has ever done before,” says Cowan. His project in the Namib Desert is part of a larger effort, dubbed the African Soil Microbiology Project, to survey the bacteria living in the soils of sub-Saharan Africa. Scientists from 10 sub-Saharan countries are collecting soil samples across 15 percent of the continent’s land area. They want to compile a comprehensive catalog of microbial communities in soils that represent the region’s diverse terrestrial biomes — deserts, rainforests, grasslands and everything in between. Cowan wants to know what makes some microbes so good at surviving the Namib’s extreme conditions. Parts of the desert can go years without a drop of rain. “If you want to understand something about the molecular basis of organismal survival, the best place to look is right at the edge of life,” says Cowan. He hopes that uncovering the adaptations that help microbial life prosper in the Namib Desert may provide clues for humans looking to adapt agricultural systems to a hotter, drier climate. A project like this wouldn’t have been possible two decades ago, according to Cowan. But new technologies have reinvented the field of microbiology and catalyzed interest in the study of soil. “For a long time, soil was just a black box,” says Janet Jansson, chief scientist for biology at the Pacific Northwest National Laboratory in Washington state. Microbiologists knew microbes were growing there, but they didn’t know what they were or what they were doing. That’s because they had no way to access them, explains Jansson. For more than a century, microbial culture was the main scientific technique in the microbiologist’s tool kit. Microbial culture involves isolating a single bacterial species by getting it to grow and multiply under controlled laboratory conditions. That technique worked great for some bacteria and helped to spawn the field of medical microbiology. Yet scientists struggled for years to get many environmental microbes to grow in the lab. Soil proved a particularly difficult environment to replicate indoors. Microorganisms in soil often work in tight-knit communities, each species performing a vital function essential to the survival of the group. Scientists didn’t know how to tease apart these complex community networks to isolate and grow individual bacteria. Luckily, now they don’t have to. New technologies now allow scientists to sequence millions or even billions of strands of DNA quickly and cheaply. Metagenomics, a new field this capability has enabled, lets researchers study the genetic material collected from environmental samples without actually having to grow anything in the lab. Scientists have used these techniques to reconstruct the genetic blueprints of millions of uncultivated microbes found on land, in the air or in the sea. Eric Becraft, a microbial ecologist at Bigelow Laboratory for Ocean Sciences in Maine, says, “microbes are probably the predominant player in every ecosystem on Earth.” Unidentified bacteria likely represent a “blind spot” in many predictive models of environmental change, he explains, pointing toward one group of ocean bacteria as an example. A vial of Sargasso Sea water yielded one of the first groups of microorganisms discovered by new DNA sequencing techniques in the late 1990s. Scientists later found that these bacteria, Pelagibacter, are among the planet’s most abundant life forms, making up about one-quarter of all plankton in the ocean. They discovered that these microbes play a huge, previously hidden role in how oceans use and store carbon. As a result, researchers had to revamp global carbon cycling models to account for the discovery of Pelagibacter. The carbon cycle is important because it moves heat-trapping carbon from the atmosphere into the oceans and soils, where it can be used as one of the building blocks of life. “The world is in flux, and microbes are key to getting a handle on how it is changing,” says Jack Gilbert, a microbiologist at Argonne National Laboratory in Illinois. And in order to understand how microbial communities are responding to environmental change, scientists first need to take inventory of what’s there. Gilbert heads an ambitious plan to do just that. Called the Earth Microbiome Project, he’s enlisted the help of more than 1,000 scientists to create a catalog of all microbial lineages on the planet — a number estimated to be over 1 trillion. The open-source Earth Microbiome Project aims to create access to that microbial diversity. “We’re opening the doors to environments where people have not looked before,” says Gilbert. Since the project’s inception in 2010, researchers have analyzed more than 50,000 environmental samples for microbial DNA. They’ve sequenced and documented microbes from soils on every continent; from animals, humans and plants; from the depths of deep-sea vents to the heights of the International Space Station. And that, says Gilbert, is the tip of the iceberg. He estimates that more than 10 million samples will be needed to really get an appreciation of the diversity of microbes on the planet. Big microbial surveys, including the Earth Microbiome Project and African Soil Microbiology Project, create a baseline against which to measure future change, say Gilbert and Cowan. Some researchers already are using microbes to monitor change in sensitive environments. 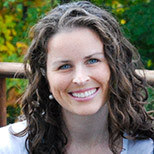 Jansson leads the Pacific Northwest National Laboratory’s Microbiomes in Transition initiative. One focus of the project includes studying the impacts of changes in precipitation caused by global warming. Precipitation is key to soil moisture, and moisture is a major driver of microbial activity in soil, says Jansson. Two ecosystems of interest include the boreal forest and the North American Great Plains. Prairie soils and permafrost — aided by their native microbes — trap and store huge amounts of carbon. “As precipitation patterns change, we want to know what’s happening to that carbon,” says Jansson. Microbes could allow us to remediate pollution; make biofuels; create new, less toxic plastics; secure the global food supply; and bolster our own health. Understanding the role of soil microbes in these key ecosystems can be instrumental in developing mitigation strategies. For instance, we may one day be able to seed soils with beneficial microbes that could help to prevent the loss of carbon into the atmosphere or even allow us to trap more of it, she explains. In microbes, scientists also see the potential for adaptation to environmental change. Microbes could allow us to remediate pollution; make biofuels; create new, less toxic plastics; secure the global food supply; and bolster our own health. Yet identifying and cataloguing Earth’s bacterial communities is just the start. To harness these microbes, we need to know what they actually do. Without this key piece, the promise of microbial technology may amount to little more than hype. “The major challenge going forward will be to validate the functions of all the new organisms we have identified,” says Tanja Woyke. In her lab at the U.S. Department of Energy’s Joint Genome Institute, Woyke has started to address this question. She’s interested in bacteria that help degrade cellulose — the fibrous part of a plant. Scientists want to create so-called second-generation cellulosic biofuels from crop waste — the unused parts of plants. A major barrier is that these residues are extremely hard to break down using existing technologies. Researchers are searching for novel enzymes that may be able to degrade cellulose more efficiently and cheaply. Bacteria that thrive in hard-to-study environments such as thermal vents, hot springs or even soil could provide a source, but most have never been grown in the lab. Microbial genes could serve as the genetic blueprints for new enzymes, but first scientists need to find out which genes are involved in specific cellular activities — such as breaking down cellulose. Woyke is developing techniques to study what newly discovered bacterial genes do. She uses fluorescent molecules to make the cellulose glow under a microscope. When the uncultivated bacteria begin to degrade the cellulose, they’ll light up too. That way she can tag and isolate them one cell at a time for sequencing. She’ll then look at the genes of these cellulose degraders and how they code for amino acids — the building blocks of all proteins, including enzymes. That way she can better understand their function and ID the genes that are important for cellulose degradation. The microbiologists say these are exciting times in their field. New technologies have already begun to transform the way we think about the diversity of life on Earth. As the science continues to advance, it will open up new vistas of research into medical, environmental and industrial microbiology. “We’re doing things and learning things now that we didn’t even know were possible just a few decades ago,” says Cowan. Microbial life is not only all around us, but inside us as well. It is evidence that human beings are inseparable parts of greater nature and require nature to survive. Yet another reason to stop destroying the planet. If we don't, we will have to go down with the ship rather than board a Tesla for Mars. Yes! I am interested in learning more about the civilizations that exist between grains of sand.